Saturday, September 11, 1982—finished the buggy, got gear ready and drove Allen’s trapline trail. Had some troubles on the way in, but got camp set up before dark. Dan flew over, it was a nice day. Sunday, September 12, 1982—mostly a nice day, a little rain and wind. Tramped all around, saw some ducks and two moose that had hooked their horns while fighting and died together. Found a weather balloon, rain and windy tonight. Monday, September 13, 1982—Ken and Danny are out here hunting too, with me. Hunted farther out. Ken jumped a caribou. Dan flew over. Tuesday, September 14, 1982—frosty morning, left camp early, went farther east. Saw nine ducks, a brown thrasher, camp robber, ravens and beaver and bear sign and more moose sign, one trophy caribou and two real nice ones. Nothing that I could get to shoot. Dan flew over and it rained this evening. Wednesday, September 15, 1982—we hunted even farther from camp. Saw some ducks and a cow moose and one caribou. Very windy. It blew so hard that Danny’s tent blew away, maybe 400 yards from where we were camped. It was one of those tents that would roll if it isn’t fastened down right and it just rolled and rolled and rolled until it finally got hung up. The tent that I had, shook, but the wind didn’t phase it a bit. Rained in the night. Thursday, September 16, 1982—wet morning not so windy, Dan flew over again. Went hunting till noon, saw some bear tracks. Left at noon, saw two cow moose on the way out, got stuck and had to winch out of a mud hole. Sunny day. Friday, September 17, 1982—slept a little late, got started on the storage shed at 10:00 a.m. And had quite a bit of it done by 6:00 p.m. Ate supper and visited Hoffmans. It was really sunny today, 30° in the morning and cloudy tonight. I feel sick tonight. Saturday, September 18, 1982—worked on the storage shed and hunted a little on the Slide Mountain. Bob Schmidt had some hinges and gave them to me for the door on the storage shed. It was a nice day; visited Dan, Denny, and Charlie T. were all there too. Monday, September 20, 1982—up very early, it was a pretty nice day. Stalked a bull moose in a large bunch of cows. We didn’t get to see them, we could hear them and the cows didn’t pay too much attention to us, but we just never got to see them. 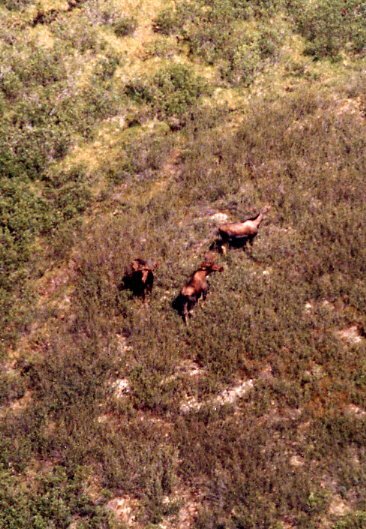 Saw four bull caribou, saw nearly a hundred moose on the ground when we got in the plane and took off to leave, Dan circled the area—that’s when we saw so many moose. There were about 50 in one bunch and about that many in the other bunch and they were about a mile apart. Salvaged lumber later at Dan’s. Tuesday, September 21, 1982—I have almost all the shelves installed in the storage shed now and started moving things into it. Sylvia went to Glennallen with Bob and Margaret. Blake and Danny stopped by. Later, Henry came home from work and took us out to supper. Wednesday, September 22, 1982—frosty morning, fine day—fantastic northern lights at night. Moved a lot of gear into the new shed. This entry was posted in Journal Entry and tagged caribou, Cessna 185, Glennallen, hunting, John Lake, moose, Northern Lights, trapline. Bookmark the permalink.